1. Lavin HorseShoe Heel in Patent, Bright Pink, theoutnet.com, 2. American Apparel Neon nail polish, 3. Cristopher Kane neon jersey tank, net-a-porter.com, 4. Balencianga neon trolley, travel, balenciaga.com, 5. Balenciaga neon thong sandals in bright blue, and neon green., 6. Jbrand low rise bright shorts in orange, 7. Deborah Marquitt neon bra, 8. Marc by Marc Jacobs enamel bracelet, net-a-porter.com, 9. Sperry Top sider in neon orange, nordstrom.com, 10. Brian Atwood "manic" neon yellow pumps, net-a-porter.com. 1. Juicy Couture blue velour sweatshirt, juicycouture.com, 2. Gap neon contrast finger gloves, Gap.com, 3. Diane Von Furstenberg Belted Silk dress orange, DVF.com, 4. Juicy Couture Fair Isle neon sweater, juicycouture.com, 5. Jcrew Cashmere cardigan in Neon Pink, jcrew.com, 6. Christopher Kane jacket yellow, net-a-porter.com, 7. Michael Kors wool crepe dress, michaelkors.com, 8. 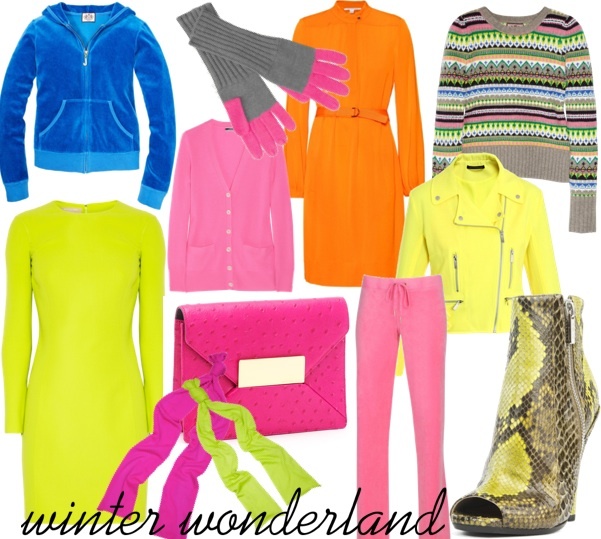 Michael Kors cashmere scarves in neon pink and lime green, michaelkors.com, 9. Juicy Couture pink velour sweatpant, juicycouture.com, Michael Kors "Quinn" Neon Pink Clutch, 10. Michael Kors peep toe booties.